Byolife Travel Pages is now available for download. This issue features some of Zimbabweans’ hidden gems and best-kept secrets. From the best accommodation in the Victoria Falls to the best diners and restaurants across Zimbabwe! 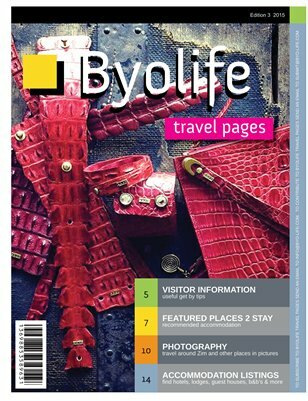 Byolife Travel Pages include attractions, dining and accommodation listing including the best photography for each month. It's loaded with great travel ideas for you including travel advice. Download and start planning your Zimbabwe getaway today!